Former Bureau of Customs (BOC) Commissioner Napoleon Morales, Lourdes Aclan , a Publisher of News Today, and Juan Tan , a former BOC collector joined forces to file a 15 page complaint to former President Noynoy Aquino and former Finance Secretary Cesar Purisima for graft and smuggling cases for allegedly allowing the Pilipinas Shell Petroleum Corporation (PSPC) to bring unleaded gasoline in the country without paying the right amount of taxes. 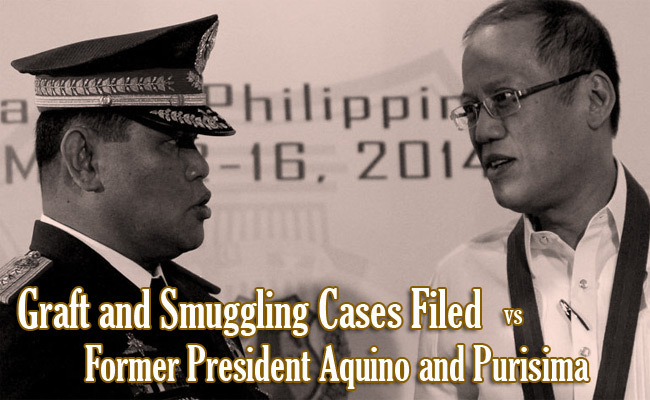 Aside from Aquino and Purisima, the complainants also filed cases against Shell Chairman Edgar Chua and other officials from the oil company. According to them, Shell falsely declared their gasoline importations as light catalytic cracked gasoline (LCCG), and catalytic cracked gasoline (CCG) then reclassified it as an Alkylate , a premium blending stock for gasoline that doesn’t have internal revenue taxes accumulated by Customs for Bureau of Internal Revenue from year 2004 until 2009. The complainants also revealed that Shell Company was paying taxes on importing unleaded gasoline from 2001 to 2004 but stopped when the oil company declared LCCG and CCG as tetrapropylene. When Tan was still a collector for Customs, he demanded Shell to pay their taxes with an amount of Php 7.348 billion that was approved by SC Justice Morales but they declared alkylate as waste oil. Meanwhile Aclan revealed that as a journalist, she wrote Aquino and Purisima a letter separately last 2012 to inform them about the matter and settle the case but she was ignored. Because of the issue, the government lost Php 100 billion including interest and surcharges. According to Morales, Aquino and Purisima should have the commanded shell to pay their taxes or stopped the importation of unleaded gasolines. Since 2011, the former president and finance secretary allowed Shell to continue using the Php 7.348 billion and Php 1.99 billion revenue of the government for their own benefit.